For Jan. 26 of the 2018 Oregon high school basketball season, here's a look back at the Plays of the Day. To see complete game stories from all these contests, go to the Prep Basketball tab. BARLOW 78, GRESHAM 54: After three lead changes in the first quarter, Barlow's boys took charge by outscoring Gresham 24-8 in the second period of Friday's win over Gresham. Evan Inglesby led the charge with a trio of 3-pointers on his way to a game-high 17 points. BARLOW 48, GRESHAM 25: After combining for only a couple buckets in the first quarter, Barlow's girls pulled away early in the second half of their Friday game against Gresham. Libby Mathis, a 6-foot-2 center, took a pass on the block and spotted teammate Whitney Waddell cutting alone to the basket for a layup. Moments later, Mathis blocked a Gophers' shot, and teammate Emory Miller scored on the resulting fast break for a 21-7 lead. SUNSET 61, WESTVIEW 59: With Friday's boys game against Westview tied 59-59 in the waning moments at Sunset High School, 6-foot-6 Apollo senior Will Reese waited under the basket as teammate Nick Cizik fired from deep. After Cizik's carom came off, Reese rose over 5-10 Westview senior guard Eric Anderson and tipped the ball off the right corner of the glass into the net as the buzzer sounded, sealing an incredible, come-from-behind 61-59 win for Sunset. PARKROSE 66 SANDY 62: Parkrose's Damontae' Brooks led the Broncos with four 3-pointers on the night, but it was the last one that put his team over the top. Trailing Sandy 62-61 with under a minute left, Leyson Farmer drove into the lane and found Brooks open on the baseline. Although Brooks' shot looked off initially, the ball bounced on the rim three times before finally dropping in the hoop, giving Parkrose the 64-62 lead. 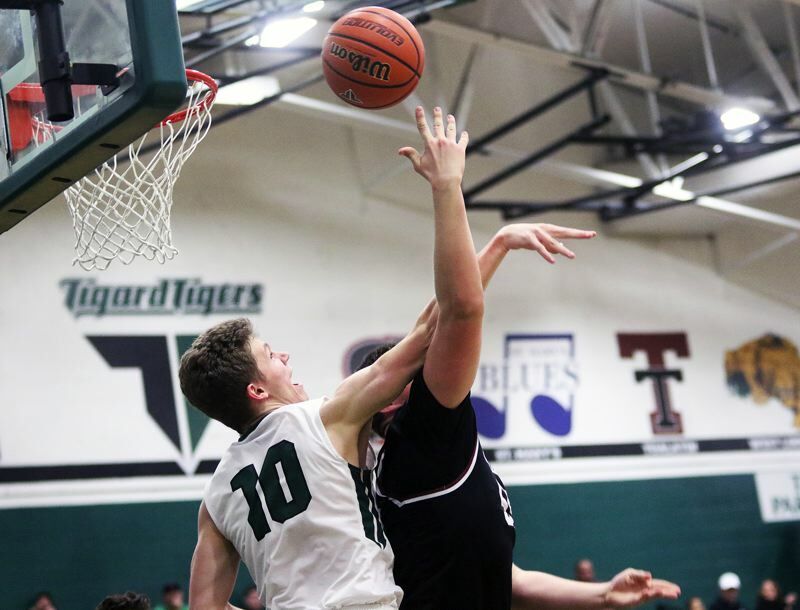 SHERWOOD 69, TIGARD 55: With the Bowmen boys team holding a 29-20 halftime lead, Sherwood senior post Jace Sucher opened the third quarter by scoring from short range with his back to the basket. He was also fouled on the play and sank the ensuing free throw for a three-point play that pushed the margin to double digits at 32-20. MCMINNVILLE 48, FOREST GROVE 20: In a game that had Greater Valley Conference championship implications, McMinnville dominated the Vikings from the start, finishing the home team even before they ever got started, the key play coming when Grizzly freshman standout Kylee Arzner scored seven straight points to make it 22-6 to open the second quarter. PERRYDALE 46, C.S. LEWIS ACADEMY 40: Every time C.S. Lewis' boys tried to rally in the fourth quarter, Perrydale answered right back with a bucket at the other end. Perhaps none were bigger than the 3-pointer sunk by sophomore Kyler Thorson. C.S. Lewis forward Tyler Dover had just hit a triple at the other end to make it 37-30 with 7:04 left to play, but Thorson's response 33 seconds later deflated the Watchmen, who were never able to get closer than seven points until the final minute of the game. CULVER 53, STANFIELD 19: Culver took over early when Mia Gamboa was fouled while she knocked down her third 3-pointer of the first quarter of Friday's girls contest at Culver High School. She converted the four-point play, and seconds later, as the buzzer sounded, the Bulldogs extended their led to a commanding 18-2 edge. STANFIELD 42, CULVER 37: Despite sitting out seven-and-a-half minutes with a hand injury, Stanfield's Brody Woods made a difference once he checked back in during the fourth quarter. Culver trailed by three points with 1 minute, 3 seconds remaining, but on the next Stanfield possession, Woods cut towards the hoop, received a pass in stride and slammed down a two-handed dunk. Culver didn't draw closer than four points from that point on. LAKE OSWEGO 74, LAKERIDGE 62: After Lakeridge cut the Lake Oswego boys team's lead to one point on a pretty Matt Armsby-to-Carter Larrance hoop near the end of Friday's third quarter, Laker post Shawn Elliott took a pass from Wayne McKinney III and scored inside to push his team's lead to 52-49 at the end of three quarters. Elliott's hoop kicked off a 24-10 Lake Oswego scoring that gave LO the victory in the Battle of the Lake contest at Lake Oswego High School. LAKE OSWEGO 47, LAKERIDGE 39: Facing Lake Oswego in the twice yearly Battle of the Lake at Lake Oswego High School on Friday, the Lakeridge girls trailed by just three points at the half. But the Lakers opened the second half with a 23-8 scoring run that gave them their biggest lead of the game at 37-23 when Katy Gilbert banked home a jumpshot from the left side to give her team a 37-23 edge with 5:24 to go in the fourth quarter. The Pacers cut that gap to just six within the game's final two minutes but couldn't come all the way back.